Ram Navami 2019 will be celebrated on April 14 this year. Lord Ram, a significant God in Hindu mythology, is much respected all over the country. Ram Navami marks the birth of the lord, so it is indeed celebrated with great enthusiasm by all devotees. The birthplace of Lord Ram, Ayodhya comes alive with the celebrations of this significant day. The day of Ram Navami is on the last day of Chaitra Navaratri, nine-day celebrations of worshipping Goddess Durga. As per Hindu belief, Lord Rama was the seventh avatar of Vishnu and the birthplace thus sees more devotional vibe on this festive day. An elaborate celebration is kept throughout the divine town. Let us tell you more about the Ram Navami celebrations in Ayodhya. Rama Navami 2019 Date: Know Everything About Vrat Katha, the Story of Lord Ram. On the occasion of Ram Navami, the sacred town of Ayodhya gets immersed in a celebratory mood. There is a fair organised in the town and people take out a procession which is called the Rath Yatra. The idols of Lord Rama, his wife Sita and his brother Lakshman along with Lord Hanuman are taken in a chariot. People dress up, sing and dance along while chanting praises of Lord Rama. It is a day to thoroughly enjoy and immerse oneself in the divine atmosphere. 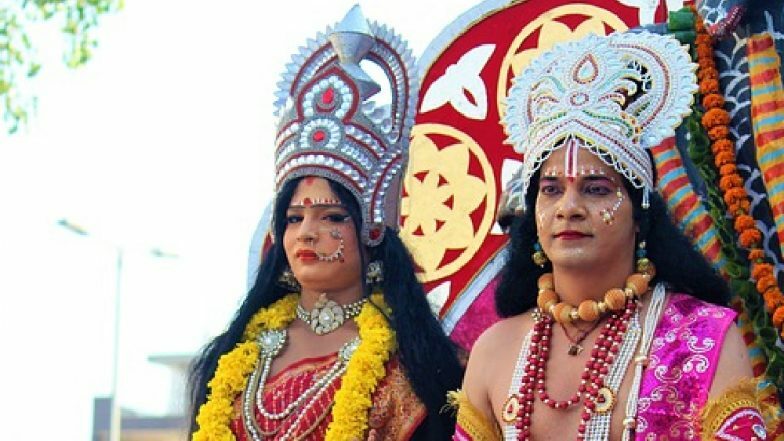 Rama Navami 2019: Ram Mandir in Odisha, Raghunath Temple in J&K and 5 Other Famous Lord Ram Temples in India You Should Visit At Least Once In Your Lifetime. Residents of Ayodhya keep a puja in their houses and also the temples. Pandals are set up in the town where satsangs are held. Chapters from Ramayana are also revised here. People perform of puja of Lord Rama and his wife Sita. The temples are cleaned and decorated with beautiful flowers. The statues of deities are dressed, bathed and bejewelled. So overall it is a day which sees ample participation from all the residents and people come together and recite Lord Rama prayers.